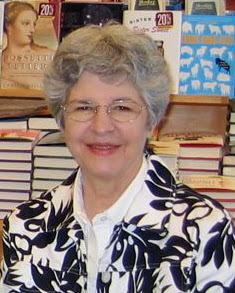 Patricia is the author of two Sylvia and Willie mysteries, The Prairie Grass Murders and The Desert Hedge Murders. She is now seeking representation for a novel set in Frontier Illinois, Wishing Caswell Dead, and is working on manuscript revisions for a novel of suspense. Kaye, thanks so much for inviting me to visit Meanderings and Muses. The idea of posting a photo of my work place, or my new pet, was fun, so that’s where I’m going in my wandering, rambling way. My husband and I have gone a bit kitten crazy since we adopted Katrina Katie Kitten from our local animal shelter in January. She’s a brown tabby, about four months old, and she’s taken over our house and lives. We’re downright silly about this cat. My husband builds pillow pyramids on the bed because Katie likes to take her afternoon nap inside. I have special toys I pull out for our morning and evening playtime. She’s demanding and bossy, and we love it. Katie reminds me to stop and…well…pet the kitten. And laugh. A lot. Bless her sweet little heart, she’s brightened our lives and lifted our spirits and pushed us to have a bit more fun in this sometimes not-so-much-fun world. So on to the photos. This was more of an adventure than you might imagine. My office is way too messy to show the whole room to the world. And I’ve had a lot of trouble getting great shots of Katrina Katie Kitten because she’s constantly on the move when she’s awake. The first photos I posted on my own blog were mostly of Katie’s tail. Sometimes, however, photo ops come along exactly when you need them and when the camera is handy. 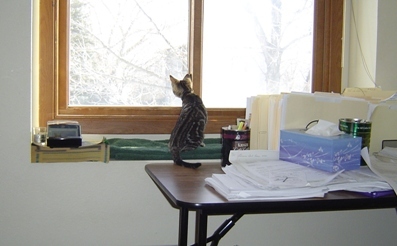 Katie likes to watch the birds and squirrels, so she has a viewing windowsill or table in three different rooms. This one is in my office. The mess of papers on the table is all I’m going to show you. And I’m definitely not going to reveal where I hide my stash of dark chocolate. The other photo is of my lap, topped with a pillow and a sleeping Katie. I’m sitting on an office chair in front of my computer, trying to read and comment on blog posts. See what I mean? Downright silly. Thanks for being here, and thanks for this wonderful piece. Isn't it funny how a little bundle of fur can just wrap itself around our hearts? And so quickly!! This little Katie is TOO adorable! I miss having cats in our house, and am in the process of discussing all this with Harley. Such pretty markings on Katrina Katie Kitten! Kaye, as always you share the most interesting authors and stories with us. Thanks. Your kitty is sure a cutie! Kaye - Thanks for hosting Pat. Pat - What an adorable kitten! 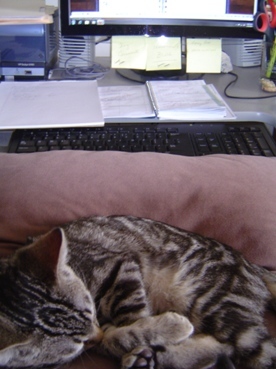 I know that our furry family members make such a difference in our lives; I couldn't imagine a home office without them wandering in and out :-). Love your post and your little kitty. She looks a lot like a kitty we had for just a short time. She was a stray that I found on the porch one day as a tiny kitten. I think she had just been taken from her mother as she was still wanting to nurse. In fact, she tried to nurse on our old dog. She was a lot like yours in personality, too, and we had a hard time keeping up with her. Unfortunately, she had a neurological disorder that we couldn't cure, so she is now running around in kitty heaven. Lovely piece, Pat. Your joy in your new little friend shines through so clearly. Cherish her. I just lost my feline writing partner on Monday. Lily, aged 16 years, 7 months, and 9 days. I take it there's more kitten petting than writing and work going on now, huh? Kaye, it's such a pleasure being here at the "in place" for authors and readers to come together. Hi Kay -- Cagney & Lacey are fun kitty names. Originally, I wanted to bring home two cats, but we only bonded with Katie. I'm sorry to hear they're no longer part of your life. Vicki -- Katie says thank you. Good morning, Mason -- Gum Drop is a great name for a kitty. I tried to use my laptop last night and Katie immediately bounced up and plopped down on the keyboard as though ready for a nap. Katie won, and I put the laptop away. Hi Beth -- Katie says thank you very much. Margot -- I admit I'll miss the kitten stage when she grows out of it. At the moment, she doesn't wander from place to place--she dashes, streaks, pounces, lunges, and hops sideways. Maryann, that's so sad. We'd be devastated if we found out something horrible was wrong with Katie. Hi Carol -- I remember how sad I was when I lost my last pet, a pug. He was my best buddy. As a matter of fact, he was everyone's best buddy, the kind of animal that would welcome a burglar and help them load up the loot. and Taffy-ta and Lily-lou and Cookie-dough and my barncat now house cat Mookie (formerly Moonbeam) We have already settled into a day of writing. Mookie and Lily on the bed, Taffy and Cookie curled up on a chair. For a minute I can get something done. ummm They are the best company. Pat, Thanks for the post, Katrina Katie Kitty is adorable. Guess who else is silly? She's such a cute cat! Pam, you are a role model for cat rescuers and cat lovers everywhere. You might be the one person who most influenced me to get the kitten in the first place, so thanks a bunch. Hi Eagle -- Katie thanks you. Kaye, thanks again for having me as your guest on Meanderings and Muses. It's been fun. Elizabeth, he is just as nutty about this kitten as I am. She's even allowed to ride around the house on his shoulders. We're very lucky humans to have someone like Katie adopt us. She's a total cutie. I love that she's brought such joy to your lives.